The mRest Gel Wrist Rest and Mouse Pad from Rain Design is a gel-filled, Lyrcra wrist rest designed to offer superior comfort. Its skid-resistant elastomer base holds the pad firmly in place and reduces strain on your wrist. The surface of the mouse pad has been designed to work well with even a precision, optical mouse. Best of all, the soft cushion on the mouse pad offer therapeutic support for your wrist and acts as an aid in the prevention of Carpal Tunnel Syndrome and other strain disorders. Use this gel-filled wrist pad to reduce strain and prevent injuries that can occur from regular mouse use. 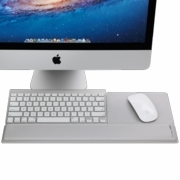 The mRest has been designed for use with Apple computers. 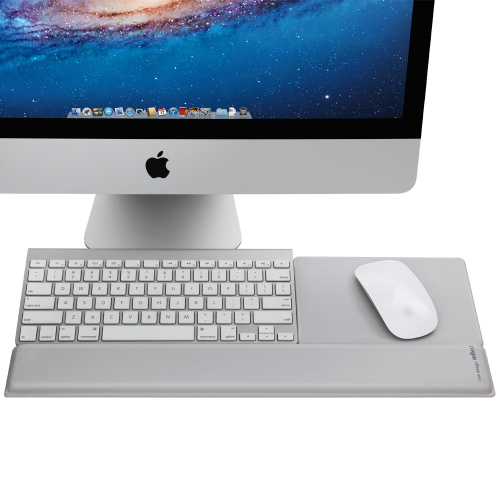 Its color scheme matches the design of a MacBook Pro, Mac Pro, or Apple Cinema Display. The mouse pad is square, reflecting the design of the Mac mini. Match your Mac by choosing either Silver or White.